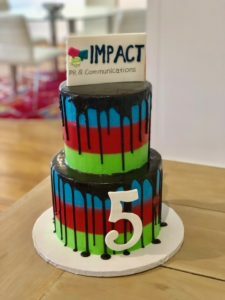 This week, we whooped it up, clinking glasses and devouring copious amounts of cake to mark the 5th anniversary of our agency, Impact PR & Communications. Sure, we could have just put up a post on social media and called it a day, but with all of the sad statistics on small business success, we decided to pause and party instead. After all, the Small Business Administration (SBA) has said that 34 percent of new small businesses don’t make it past the two-year mark. And, for those who do, another chunk will falter in the three years that follow. 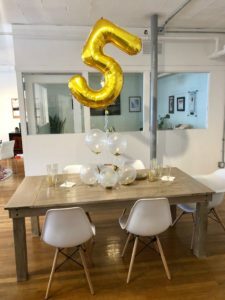 The U.S. Bureau of Labor Statistics notes that approximately half of all new businesses can’t keep the doors open long enough to celebrate a fifth anniversary. Ouch, ouch and ouch. 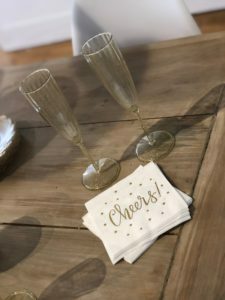 Our founder, Filomena, has plenty of business-owner friends and mentioned how, a few years back, one of them crossed that meaningful five-year mark. She was reluctant to cheer loudly and hold an event, figuring the 10-year anniversary would mean even more. Having watched her launch and grow her business, and knowing all the sweat, tears and joys along the way (and we’re certain we only knew a fraction of them), we wished she would have done it up big. Invest in yourself early on. The way you see yourself, or your business, becomes the way others see you. Establishing a clear brand early on, consistently living that out through every touchpoint, from website and social media to collateral and photography, establishes trust. 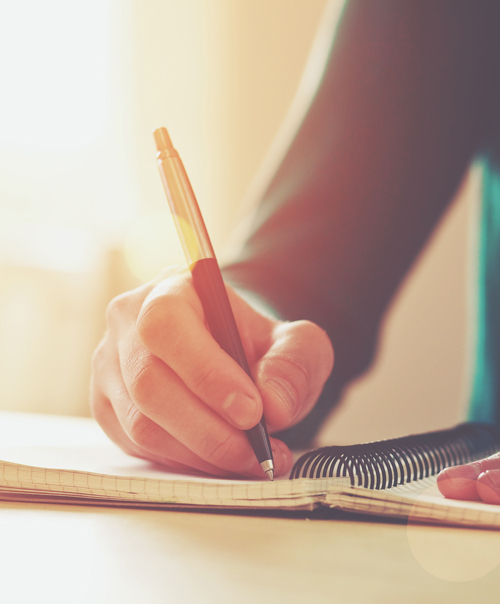 Plus, nothing more strongly proclaims your belief in yourself than an investment in yourself. That company that builds its website on a cheapo do-it-yourself platform, skimps on the business card, lacks professional headshots or avoids investments in technology tells people through their actions that they want their money (or faith as a customer) but aren’t even willing to put their money where their mouth is. If you can’t spend on you, why should anyone else? When a business has achieved a measure of success, it should be willing to go bigger or prepare to stay small – and rapidly lose market share. Hiring employees as soon as possible, including ones with serious skillsets and the pay grade to go with it, allows a company to build market share. When you hire smart folks, they bring fresh ideas and enormous energy to a brand (in our case doing so helped us help more companies, which meant we could grow). Bill Raveis, one of our agency’s early clients and the owner of William Raveis, a CT-based residential real estate firm and the largest family-owned one in the Northeast, once famously talked about being in his first office, above a supermarket, and realizing that the furniture wasn’t going to make him any money. If you remain as you are, you won’t have the extra hands to make extra products and, if you’re in a service business, your ability to earn will be tied to your own 24 hours in a day, versus the 48, 72, 96 or more you’ll have when you add the right people to the mix. Plus, as Raveis said, the furniture won’t make you any money. Not every customer is a good customer. This was a challenging lesson to learn, but the demanding, underpaying or underappreciating types take valuable time and bandwidth away from the clients who get it and deserve a company’s loyalty and unbridled creativity and enthusiasm. Shedding those who are not a right fit, or referring them along to those who are, is a short-term loss for a major long-term gain. Ditto working with others who don’t embody your firm’s values. There are plenty of people out there who are aligned with what you’re looking to build and the sooner you surround yourself with those people (and bid a cheerful adieu to those who do not), the firmer you’ll stand in your values and the closer you’ll get to achieving your dreams. Wondering what the last two tips are? Head to the full story, from the April 2, 2019 Westchester County Business Journal. 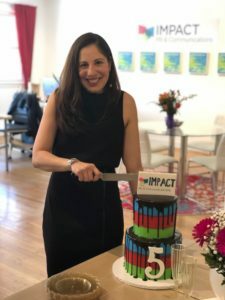 Curious about how Impact gets its celebration on? Check out the photos below! One last thing: a special note of thanks to all of the client partners, members of the media, friends and family of the agency and super sharp, kindhearted team members, past and present, who have made Impact what it is today. We’re in a relationships business and the best part of that is the people we forge friendships with along the way. Here’s to you!